It’s just about summer so you know what that means, right? Time to schedule your “tea” time! 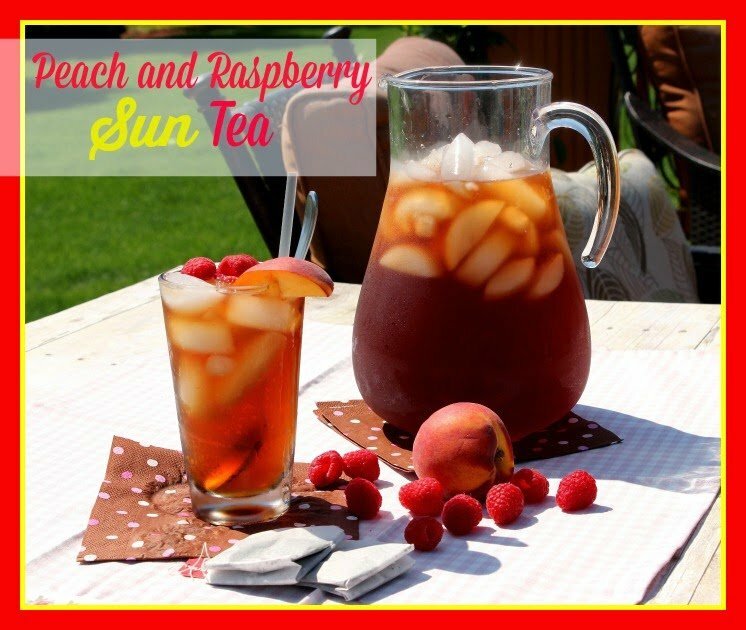 In my book, there’s no better way to do that than with this Peach and Raspberry Sun Tea that is sweetened with cilantro simple syrup! Ahhhh. Ice cold and refreshing. This tea is sure to wet your whistle on a hot summer’s day. I tend to like my tea mildly sweet so I didn’t go overboard with the cilantro simple syrup. Feel free however to double what I added if you prefer your tea on the sugary side. By the way, did you know that June 10th is National Iced Tea Day? Time to celebrate with a tall, frosty one, don’t you think? 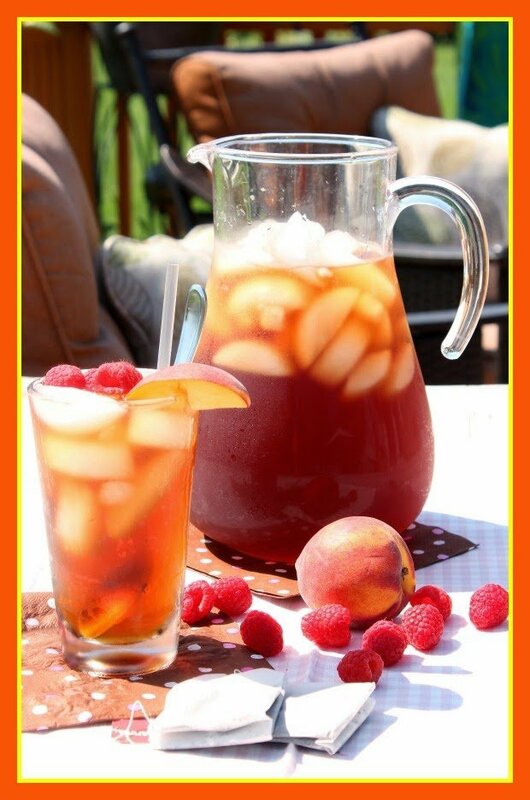 -Fill a 1/2 gallon pitcher with the purified water, tea bags, peaches and raspberries. 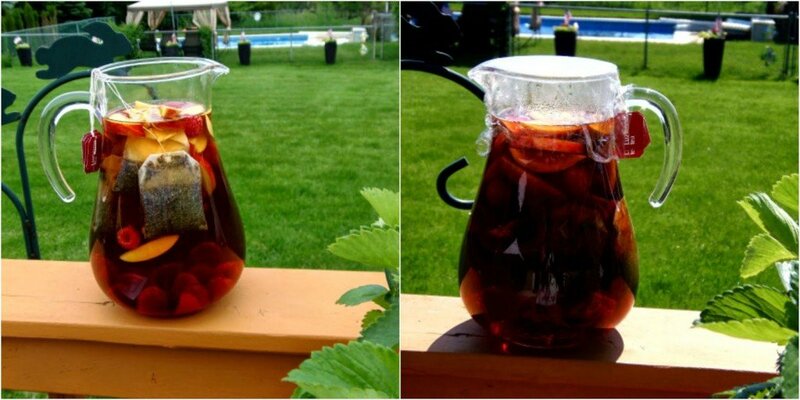 -Set the pitcher in the sunshine for at least 8 hours. -Strain the peaches and raspberries from the tea and discard. -Place the strained tea in the fridge to cool completely. -To make the simple syrup, bring all the ingredients to a boil on the stove top until the sugar dissolves. -Strain out the cilantro leaves and discard. -Add the simple syrup to the cooled tea. What I love about this pilsner is that it can be customized for your favorite 3 holes on your favorite golf course. All you need to do is supply me with the name of the golf course of your choice and some images of the golf course score card (or point me in the direction to where I can find them on the web). 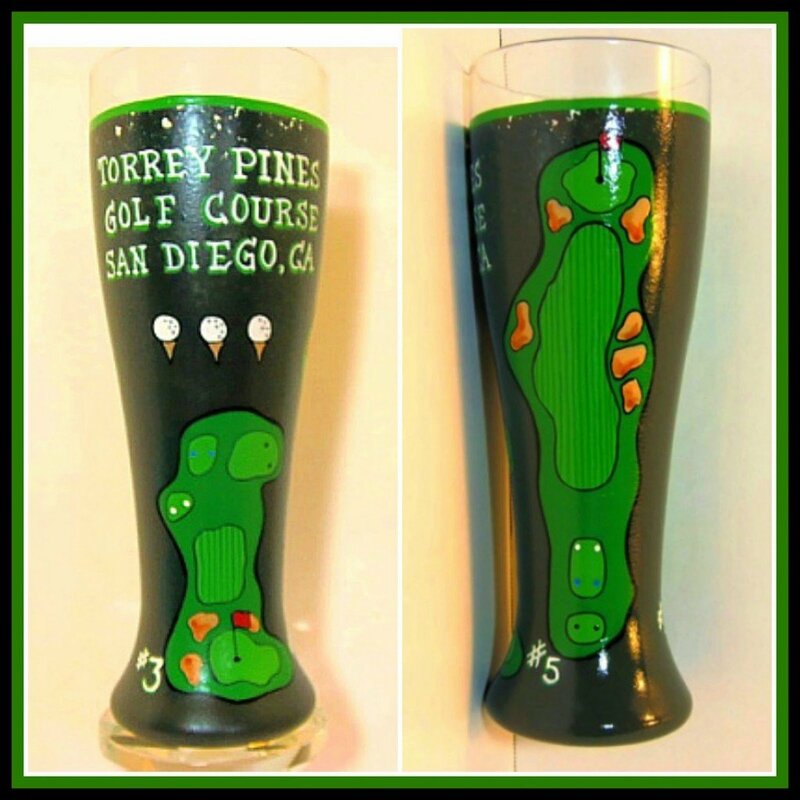 Wouldn’t it be fun to have all 18 holes on an entire set of 6 pilsners to use and display in your own home or man cave? That can definitely be done! I aim to please…but you’d better watch out because I’m not that good of a golfer. FORE!!! If there is ever anything I can paint for you, please don’t hesitate to contact me or visit my shop which is located within the navigation bar. Custom orders (like this) are always welcome and I can work from any photo or description you send my way.